James Wigington has been dealing in antiques for over 40 years. The family business was established over 100 years ago in Shipston on Stour, Warwickshire, specialising in arms and armour. 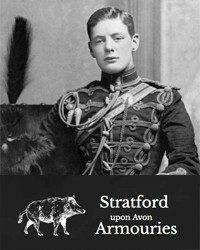 In 1932 James’ father moved the business and his family to Stratford upon Avon, occupying a shop opposite Shakespeare’s birthlpace. James’ late father was one of the early members of the British Antique Dealers Association (BADA). His late brother, Robin also had a shop and museum in Stratford, dealing in arms and amour, including the weapons of Tipu Sultan. Some of the weapons from Robin’s collection sold at Bonhams recently, achieving world record prices in the millions. James’ own interest quickly grew to include early fishing tackle, antique furniture and works of art. In 2006 James and his wife Jayne built Stratford Armouries which houses a collection of Churchill memorabilia (formerly housed at Bletchley Park), a Wellington bomber exhibition and a small collection of antiques which he has for sale. STRATFORD ARMOURIES to provide own terms and conditions. Consumer Contracts Regulations apply.